In the recent student survey, we received several requests for services or resources that we already offer, and we are pleased to highlight them here. If you have additional questions about any of these, please contact any of our service desks. Calculators and bookstands are available for checkout at the Circulation Desk in addition to a number of other useful items, such as phone chargers and flash drives. Please continue to send your suggestions to us for any other items that you would like the Library to provide. Two scanners are available in the Loewinger Lounge of the Reading Room. Photocopiers also have a scan function and are located in the Loewinger Lounge, as well as on the 3rd floor in room 324, and on the 4th floor in room 425. The Xerox printers may also be used for scanning, and are located in the computer lab on the 3rd floor, and on the west side of the 4th and 5th floor. You may purchase your items with your GoCard or credit card. You may also create and manage an account with Legal Eats by pressing the “Manage Account” option and inserting cash into the payment kiosk. For additional information about setting up an account with Monumental Markets and other payment options, please contact the customer support representative. Popular newspapers and magazines and DVD collections can be found in the Williams Reading Room near the Loewinger Lounge. The Library also purchases some bestsellers and newly published novels each year to add to our Popular Reading Collection. Students may also request books from the main campus’ Lauinger Library, as well as from local libraries through the Washington Research Library Consortium (WRLC). Students may also apply for membership with the D.C. Public Library. To search for the availability of electronic resources which provide access to foreign case law, please consult the list of databases from the catalog, or the collection of Foreign & International Law Research Guides for guidance in locating resources for a jurisdiction. We also appreciate your input and encourage you to send suggestions to our suggestion page. The Library adds new materials to the exam archive database as they are received from the Registrar’s Office, which collects not only exams, but also best exams and feedback memoranda from the faculty. If there are any problems or questions about any files in the Exam Archive, please contact us through our suggestion form. Georgetown Law Library patrons may eat snacks in many areas of the Williams Library. Aromatic, noisy, or greasy foods are not permitted. No food is allowed in the Williams Reading Room (2nd floor), the Special Collections Reading Room (2nd floor), the media rooms (1st floor), or the computer lab and computer learning centers (Reading Room 2nd floor, 3rd floor west side). Beverages in closed containers are permitted in the library except in these locations: the computer lab and computer learning centers. For those wishing to purchase snacks and drinks or to consume larger meals, please visit our self-service café, Legal Eats (1st floor). A hot water dispenser can be found in the café as well. The Reading Room of the Library is a designated quiet study area. Conversations are to be expected at the Reference Desk which is one of the Library’s service points. Earplugs are also available at the Desk. Cell phone conversations are prohibited, with the exceptions of the second and fifth floor atriums and the landings on each floor. When entering the Reading Room and stack areas, please silence your phone. In addition to the 22 group study rooms (18 in the Williams library and 4 on the third floor of Hotung), the library will once again provide additional group study rooms during the exam period. From April 23 through May 15, unassigned Scholar Studies will be available for reservation. Scholar Studies are smaller spaces that accommodate a limited number of students, 2 at maximum. These studies will require only one Law NetID and can be reserved up to 5 hours a day. An option to cancel the reservation will also be available in the email confirmation for the reserved study room. Go to the Group Study Room reservation page to reserve these study spaces. Reference Librarians are available to assist you with your research questions at the Reference Desk in the Reading Room on the main floor. During the academic year, this desk is open from Monday – Thursday 9:00am to 8:00pm; Friday 9:00am to 5:00pm; and on weekends 12:00noon to 6:00pm. During the summer and school breaks, there is no evening or weekend reference service. You can email the desk at lawlibref@georgetown.edu, call 202-662-9140, or Chat with us. We are also available for individual research consultations. Remember, we’re here to help you succeed in your research! This entry was posted in Library News, Library Policies, News for Students on May 11, 2018 by Laura Addiego Prospero. 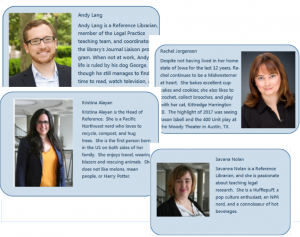 We have concluded the 2018 Annual Student Survey for the Georgetown Law Library. This year, 370 students responded. Thank you. We appreciate all feedback. All students who completed the survey were eligible for a prize drawing. Congratulations to our four student winners: Valentine Carey (JD ’18), Robert Van Someren Greve (JD ’18), Garrett Windle (JD’18) and another law student (JD’21). Each student received either a $50 deposit to his or her GoCard account or a $50 Amazon gift card. Thank you to all 370 students for participating in this year’s survey. We’ve already started reviewing responses, and we’ll use this input to inform decisions about services and resources. You can view 2018 quantitative charts and a response summary on our website. The second-most frequent reason listed is to study in a group study room. The library will once again provide additional group study rooms during the exam period. From April 23 through May 15, unassigned Scholar Studies will be available for reservation in addition to our usual 22 group study rooms. Scholar Studies are smaller spaces that accommodate a limited number of students, 2 at maximum. These studies will require only one Law NetID and can be reserved up to 5 hours a day. Go to the Group Study Room reservation page to reserve these study spaces. This entry was posted in Georgetown News, Library News, News for Alumni, News for Students, Research, Technology News on April 24, 2018 by Laura Addiego Prospero. The Law Library is conducting its annual survey on our collections and services. Please take about a few minutes to give us your feedback. We promise to read every comment submitted, and we’ll do what we can to act on and respond. Based on feedback in prior years, we added more filtered water stations, purchased additional book scanners, opened a self-service café in the Williams Library, added adjustable standing desks, and released the OneSearch platform which searches the library’s print as well as many of the electronic resources at the same time from one central location. For the Spring 2018 Georgetown Law Library Survey, we will award four prizes of $50 which will be added to a Georgetown GoCard or given in the form of an Amazon gift card, depending on each winner’s preference. After completing the survey, you’ll have a chance to submit your email address for the drawing. We will keep the survey open through Monday, April 2nd and plan to announce student winners soon after this. You can review a summary of survey responses from 2007 to 2017 on our website. This entry was posted in Library News, News for Students on March 27, 2018 by Thomas Boone. You interact with reference librarians at the Reference desk when you have a question, but do you know their names? We’ve put up a display in the atrium exhibit case with info on all of the librarians who staff the Reference Desk. Find out who has a dog named George or a cat named Kittredge Harrington III! 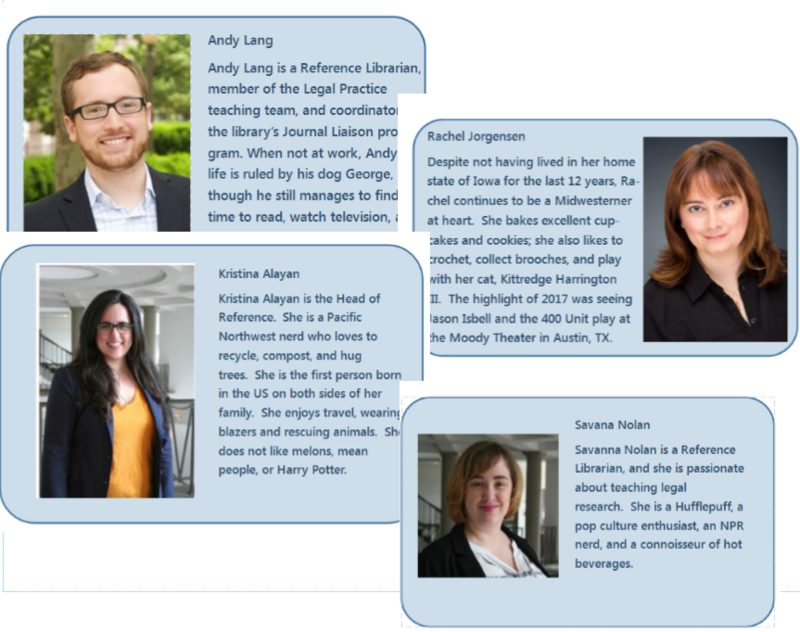 Who practiced law in Chicago before becoming a librarian? Who’s traveled to Norway or France? Check out the exhibit and meet your librarians!! This entry was posted in Current Awareness, Georgetown News, News for Students on January 17, 2018 by Margaret Krause. Georgetown Law Library’s reading and exam period will be in effect Monday November 27th and run through Saturday December 16th. During the reading and exam period, the Williams Library will remain open 24 hours. For the benefit of Georgetown students studying for exams, only Georgetown University students, faculty, staff, alumni, members of the Friends of the Library program and Public Patron card holders will be admitted through the end of exams. Students from other law schools will not be admitted during this time. Details about Circulation Desk and Reference Desk availability can be found on our Library Hours Calendar. This entry was posted in Library News, Library Policies, News for Alumni, News for Faculty, News for Students on December 6, 2017 by Jill Smith. Get ready for your exams at the library! As you begin to prepare for exams, supplement your assigned readings and review past exams with study aids found in the library. Study aids can clarify confusing concepts and even provide practice questions for your review. A variety of study aids are available and the best one to use depends on your course and individual study habits. Most of these books can be found in the Williams Reading Room (in the left hand alcove), with older editions in the stacks available for checkout. CALI lessons are another useful exam review option. Over 800 interactive lessons prepared by law professors and librarians cover over 30 practice areas of law. Georgetown students can register for immediate online access. This entry was posted in Library News, News for Students on November 29, 2017 by Margaret Krause. The library now has an all-new set of tutorials on how to set up and use Juris-M (a variant of the Zotero citation manager that is optimized for legal use). If you’re interested in a more streamlined way to manage citation information for seminar papers or other uses, please take a look. This entry was posted in How-To, News for Faculty, News for Students on November 28, 2017 by Jill Smith. Construction activities related to Capitol Crossing require the city water department to shut off water to the Williams library building from 8:00 p.m. to 5 a.m. on Monday (11/20) and Tuesday (11/21). Water will be working in all other campus buildings during this water shut down. This entry was posted in News for Students on November 17, 2017 by Matt Zimmerman. Please note items cannot be left unattended for extended periods of time, or overnight, in unassigned carrels or study spaces in an attempt to retain this space for your future use. Materials left will be removed and held at the Circulation desk, then sent to DPS “lost and found” in the morning. This entry was posted in Library Policies, News for Students on November 14, 2017 by Jill Smith. Stay on top of political news and the happenings around Washington, DC with our new subscription to Politico Pro. The subscription includes articles written by Politico experts on health care, cybersecurity, energy, technology and much more. This entry was posted in News for Faculty, News for Students, Uncategorized, Washington Culture and News on November 8, 2017 by Margaret Krause.